You may know him as Teddy Fitz, but our beloved brand ambassador actually answers to the name of Teodoir Ulysses Fitzpatrick. His middle name stems from his Mother’s love of reading, her favorite book remains ‘Ulysses’ by James Joyce. Teddy Fitz inherited his mother’s passion for reading and some of his favorite authors include Oscar Wilde, Roddy Doyle and James Joyce. Born in Dublin Zoo, Ireland on March 17th (he claims he can’t remember the year) Teddy Fitz traveled to New York in 1991 to join Fitzpatrick Hotel Manhattan on its opening day. He still travels back to Dublin a few times a year to catch up with his family and loves to visit different Irish tourist spots while he is there including, The Guinness Storehouse, Trinity College and of course Dublin Zoo, of course it’s changed a lot since he lived there! When Teddy Fitz left Dublin Zoo on his maiden voyage to New York, his cousin the Red Panda moved into his house. Did you know that Teddy Fitz also has an American cousin living up at the Bronx Zoo. When you visit Teddy Fitz in New York, he is always sure to offer you a cup of tea. Of course Teddy believes that Barry’s Tea is best and loves a ‘cuppa’ with a dash of honey! If you’re joining him for lunch or dinner, be prepared for some delicious Fitzpatrick’s homemade brown bread, followed by either salmon or sausages (Teddy’s favorites) finished off with a side of the finest Irish honey! Teddy may have lived in New York for a long time but he never forgets his Irish roots and still chooses to dine on Irish classics when he can! On his days off, Teddy Fitz loves to spend his time catching up on Irish sports, he’s a loyal fan of the Irish rugby team and even traveled to their match against New Zealand in Soldier Field Chicago in 2016! A very proud day for Teddy Fitz as Ireland beat The All Blacks 40-29, it remains one of his sporting highlights! He also follows Gaelic Football and Hurling, when he is watching these you will often find him on the phone to his Dad, Father Fitz, discussing match tactics! Teddy Fitz is also a very big music fan and some of his favorites to listen to include U2, The Script, Paul Brady, Phil Coulter and Snow Patrol! He has been known to show off his Irish dancing moves so watch out if there’s an Irish song playing in The Fitz or The Wheeltapper! 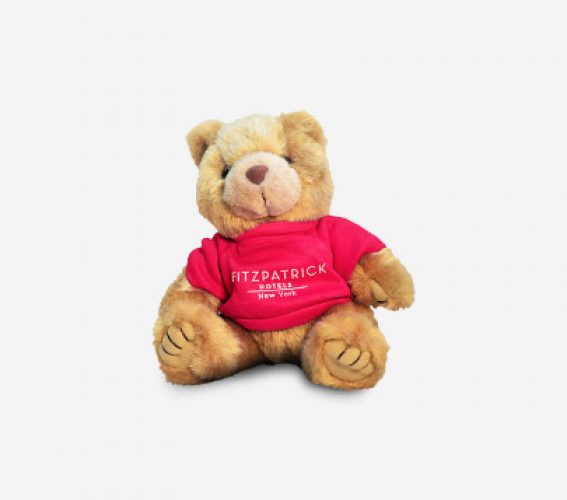 Teddy Fitz’s favorite part of his role as Brand Ambassador for Fitzpatrick Hotel Group is to welcome families and friends to the hotels! He loves to share his information about the top things to do in New York! He also has some tips for those of you looking to visit his home place of Dublin! In our eyes, he is the go-to teddy for all New York related questions, so be sure to ask him for all the top tips and tricks!